I know, I know, this is a decorating site, but the weather is warm; it's spring, so my thoughts naturally turn to "decorating" the outdoors. Often, a part of your yard won't grow grass. Usually because it gets too much shade. Or perhaps, you have an area that's too difficult to mow. Ground cover always offers a great solution to these trouble spots. Ivy works well. Vinca minor is also a good choice that spreads quickly but is not invasive to other plants. 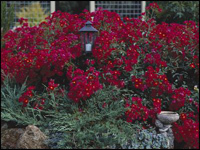 Here's a colorful option - ground cover roses. 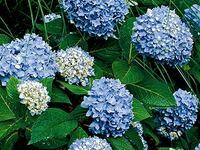 It spreads fast, grows 24-32 inches high, blooms nearly all season, and just requires watering and a little maintenance. This ground cover prefers sun. If you need a ground cover, but want some color. Check out www.flowercarpet.com. I don't often talk about landscaping and gardening for two reasons. I'm better inside the house than outside and most people who come to My Home Redux want decorating advice. But making your home look beautiful on the outside is important too. After all, it's the part that everyone can see 24/7. So when I read about this rose, I had to share. I know some of these beauties are going in my front yard. 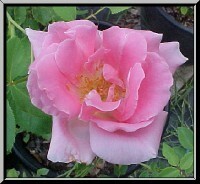 The rose is a low-maintenance, hardy, rose/shrub hybrid. What does that all mean? It means it doesn't require the typical care that rose bushes do, is disease-resistance, can grow anywhere, and blooms all growing season. Sounds like rose nirvana. It's called Carefree Beauty. Learn more and order on line here. As readers know, I've been planning to landscape the front of our house this summer. But finding the right plants, shrubs, and perennials is difficult. You need to know what works in sun vs shade, how big will it grow, how to balance blooming cycles, and what looks good together. I've also learned that two plants I really like - azaleas and hydrangeas - are poisonous. Not good with two puppies that eat everything they see. 1) Take pictures of plants that you like in your neighborhood or as you drive around town, go to a nursery and find out what they are or ask at the nursery to identify the plants for you. Then find out if they're sun or shade, perennials or annuals, etc. 2) Spend several hours just browsing at a nursery and garden center. Read the labels because plants that are blooming now, won't later, and some will bloom later that aren't now. You'll want to balance this to give you color throughout the growing season. Take notes so you'll remember when you leave and go home to design your landscape. 3) Check out this site. They have a plant finder where you query type of plants, size, shade, sun, growing zone, and more. I'm not sure the list is entirely complete, but it certainly helps you find plants to fit your situation. By using some or all of these methods, you can figure out what plants you want to use in your landscaping. Of course, you can also hire a landscape designer or architect to create a plan for you. But what's the fun in that? As I wrote last week, I really want to landscape the front of the house this spring (or is it nearly summer?). 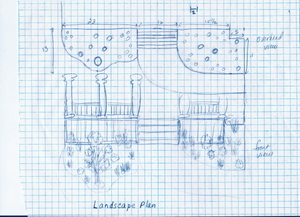 The first step was measuring out the space and planning the number and layout of the plants I would need. See my plan above. You'll notice a few things: the plants are arranged in odd numbers (1 or 3), plenty of space is left for growth, sizes and shapes vary (as will colors). Given the size, I may need to actually do some areas in groups of five. But I want to leave plenty of area for growth. Perennials and bushes all spread. Trees grow. If you plant too many or place them too close together, landscaping will get overgrown quickly. Be especially careful of overplanting with trees because as they grow the branches may get too close to your roof, the roots too close to your foundation, and the shade may kill off other plants. Also, I've drawn a basic perspective from the front to help me determine the height of the plants I select. Next, I need to identify the plants and perennials I want to use. I will certainly be looking for some of the flowering shrubs mentioned in this post from last week. This is the year I finally get the front yard landscaped. Yes, I've said it for the past two years, but this year I really mean it. The part that has held me up in the past is picking the right plants. I want perennials or small flowering shrubs, but I want the color to last all summer. Most perennials bloom either early, mid, or late summer. In this article, I learned of eight great plants for landscaping. Many are hybrids and bloom all summer long. Take a look and stay tuned as my front landscaping project unfolds. Spring is coming, and you want to add some pizzazz to your lawn and some curb appeal to your front yard. You know you want the landscape to be lush and beautiful, but what to plant, where to plant it, and how to make it all look good together. That's a great deal to cover, but let's start with the plan. The keys to good landscape design are just like any other design - balance, color, unity, lines, and variety. What do these mean and how do you incorporate them? Read this article to get a good sense of the basics.